Sometimes justice comes late, but if the crime is terrible enough, the world should still pay attention. A United Nations tribunal has just found two of the most senior figures of Cambodia’s old communist party, the Khmer Rouge, who ruled from 1975 until 1979, guilty of genocide. Nuon Chea, aged 92, and Khieu Samphan, 87, have been sentenced to life imprisonment. Both were key figures in one of history’s worst regimes. Their former titles of Brother Number Two and Brother Number Four showed their position in the Khmer Rouge hierarchy. Brother Number One, of course, was party leader Pol Pot. Even among the tyrannies communism has produced, those of Ceausescu, Mengistu, Stalin or Mao, that of Pol Pot and his comrades stands out in evil. The aim was totally to reshape society: purging out the bad and purifying the population through manual labour and political study until communist utopia could emerge. The death toll and suffering they brought was limited only by the small size of the population they controlled. Although estimates vary, in under four years the regime murdered roughly two million of Cambodia’s eight million souls. Of those allowed to live, anyone who had the wrong background or attitudes endured a miserable existence. The entire country was turned into a joyless starving work-camp. Cities were evacuated at gunpoint. The whole population lived in rural communes, under the baleful watch of vicious guards, often teenagers, sometimes pre-teen, licensed to use violence at whim. People would be beaten to death on suspicion of disloyalty. Any expression of ‘individualism,’ anything separating you from the collective was criminal. The only love permitted was for ‘Angkar’ which loosely translates as ‘the organisation,’ the regime’s name for itself. Deviance meant death. Political prisoners were force-fed human excrement and tortured horrifically to force bizarre confessions to impossible crimes, before their inevitable execution. Most communist regimes have had their western apologists sticking up for them, explaining away the crimes and the corpses. The Khmer Rouge, though, were so terrible that it’s hard (but not impossible) to find anyone to defend them. Most of the Left have tried to put as much distance as they can between themselves and the Khmer Rouge. Tortuous attempts have been made by Communist theologians to explain that the Communist Party of Kampuchea (as they renamed the country), with its red banners and hammer and sickle emblem, wasn’t actually communist at all. It was just a bizarre political aberration for which the Left had no responsibility. In fairness, the Khmer Rouge were at the extreme and many Leftists found them disgusting. We should be careful before accusing anyone of guilt by association. It’s also true that there were features of Khmer Rouge ideology that can’t be traced to its Marxist roots. For example, its extreme xenophobia, which led to extermination of much of the country’s ethnic minority population. But it was still a party owing much to Marxism; its existence would have been impossible without the cover of Marxist ideas. Pol Pot and leading party members picked up their revolutionary politics as Communist Party members in France, then Cambodia’s colonial power. They were also deeply influenced by their communist North Vietnamese neighbours, before their eventual falling out, and by Mao. Particularly Mao’s reformulation of conventional Marxism to apply it to a peasant, rather than an industrial society. Then they made their own doctrinal adjustments to local conditions. The changes don’t mean they weren’t communists. It’s simply an example of how ideologies adapt and evolve over time. 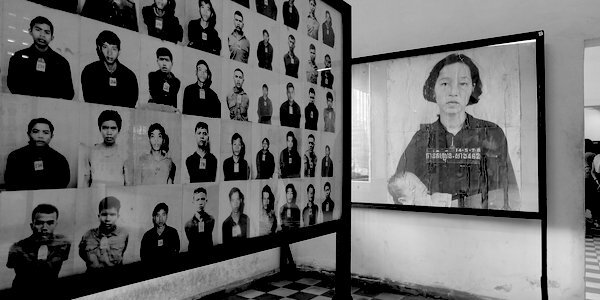 Many features of Khmer Rouge society were unremarkable for communism; conscription of labour, class hatred, incessant propaganda, collectivised production and the ubiquitous spying and fear. And while they went further than others with the abolition of money and almost total elevation of the collective over private or family life, these were things to which elements of other communist parties had long aspired. One striking thing about the regime was how even its most senior ranks seemed to avoid the corruption and personal enrichment that often goes with dictatorial parties. Certainly, they had better living conditions than the general population who were in effect no more than slaves. But there was little ostentation. In many districts the normal way to show status, in a country where everyone wore black peasant pyjamas or military fatigues with no insignia, was the number of ballpoint pens a party cadre had in the breast pocket. Importance went up with the number of ballpoints. They claimed, as communists often do, that their identification with ‘the people’, their simple living standards and self-denial showed the purity of their motives. Classic Marxism. In reality, this simply concealed what they really sought: the exercise of brutal power over human beings; the intoxicating knowledge of one’s own ideological superiority and membership of an elect, a chosen few; The Party, so much gloriously stronger than one’s own puny and mortal self. Whatever Marxists might claim to believe about how economics and material acquisitiveness underlie most of politics, the desire for power, dominance and righteousness can be stronger and is always far more dangerous than simple greed or venality. The Khmer Rouge were an outlier on communism’s edge that most of the hard Left would like to pretend never happened. But if you consider some of the other florid ways that communist regimes or parties have developed: Peru’s mad homicidal Shining Path, or North Korea, whose ideology combines Marxism with bizarre super-naturalism; or Mao’s cultural revolution, perhaps the Khmer Rouge were not that aberrant after all. And there are of course other examples. Much of history is made up of a long and terrible list of crimes, calamities and atrocities, all deserving of being remembered. But some events and some perpetrators, such as Nuon Chea and Khieu Samphan, are exceptional. Both, already imprisoned for other crimes, will die soon enough, while Pol Pot died in jail in 1998. Some of their comrades are still free, old men living on the margins, hidden away from attention. We should not forget them. Not only out of respect to their victims, but for the warning they give of the dangers of an ideology that history has still not managed to eradicate.